For example, if you are struggling with fear or feel vulnerable, call on Archangel Michael. If you’re grieving and want to release sadness, call on Archangel Azrael. 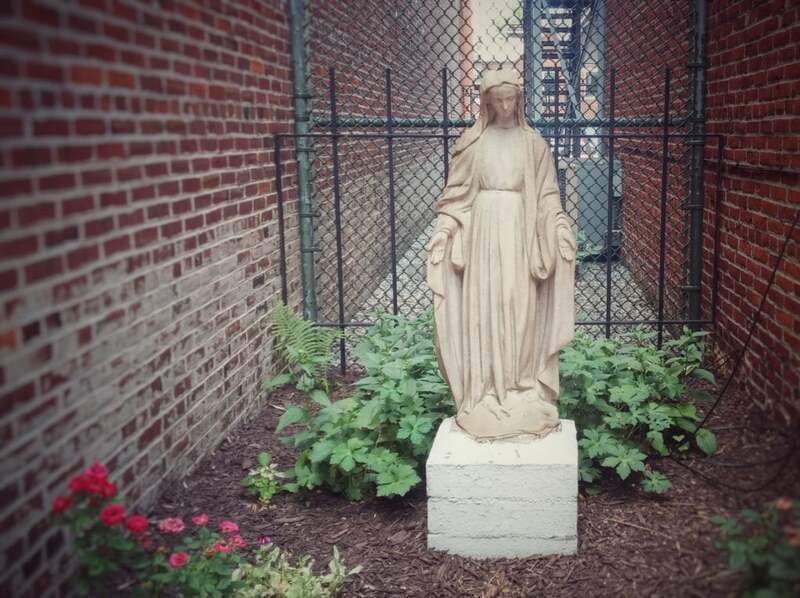 If you’re having issues with your children, call on Mother Mary. Want to develop your intuitive abilities or even become a professional psychic? Bring in Merlin. Archangels are angels of a high rank, much like Ascended Masters – the prefix ‘arch’ means ‘chief’ or ‘ruling’. My work in the Akashic Records has taught me that there are seven realms of existence in the Universe – each realm holding a particular kind of energy that we associate with life here on earth. And each realm is ruled over by seven archangels respectively. Hence we tend to associate a certain Archangel with a certain type of energy, and we can call on each one for a specific purpose. Archangel Michael is a spiritual protector and warrior – he is often depicted armed with a sword given to him by God. His energy is both fierce and loving. He banishes fear and reminds us that light is always more powerful than darkness, so call on Archangel Michael if you often feel anxious and need that protective energy in your life. Archangel Raphael brings the energies of healing, gentleness and love. He helps to soothe broken hearts and heal our wounds. Call on Raphael if your heart feels a bit tender and you need some gentleness. Archangel Gabriel is the angel of writers and communication. She is the only archangel depicted as a woman and mentioned in both the Old and New Testament of the Bible. If you need to communicate a message personally or professionally, call on Archangel Gabriel. Archangel Gabriel can also help with motivation and confidence, and in all areas related to children. Archangel Uriel is great to call on for emotional healing. He can help with difficult relationships, illuminating situations and enabling us to see through feelings that can make us feel stuck, such as judgement or anger. Archangel Uriel can also help with studies, tests, or meetings by inspiring us with ideas. Archangel Metatron can be called on for healing and to help clear lower energies and replace these with higher vibrations. He can also help us to find balance in everything we do, reminding us to give and receive in equal measure and keep our boundaries in place. Archangel Metatron watches over sensitive children, as well as indigo and crystal souls, helping to ease any social anxiety or fear. Archangel Chamuel is the angel of peaceful relationships. He can be called on to help us find the strength and willpower to face challenges, whether small or large. As he can see the connection between all things, Archangel Chamuel can also be called on to help find items that are lost. Archangel Azrael is sometimes referred to as the Angel of Death, although his name actually means ‘whom God helps’. Archangel Azrael guides souls who have newly crossed over, assisting them through this transition. He also provides support to loved ones who may be grieving. Archangel Azrael can assist during times of transition, whatever form this may take. He is a great archangel for those working within counselling professions or support roles to call on. Ascended Masters are souls who have ascended beyond the need to incarnate here on Earth. They may appear on Earth in human form as healers, prophets, or teachers, but this is not for their own soul growth – instead it is for the benefit of humankind. Over many years, so many people have called on these Masters that it lends them energy and they become spiritual figureheads that we can call upon for assistance and support. Below you’ll also find the Ascended Masters that my students most often choose to work with. Mother Mary is the Ascended Master from the Catholic and Judeo-Christian religions, therefore many Catholics present with this energy around them. Mother Mary also accompanies those whose life purpose is to work with children or help children in some way. Mother Mary helps with all issues relating to children, including fertility, parenting, and adopting, so it is not surprising that parents, and mothers in particular, often present with this energy around them. Mother Mary is the archetype of the ‘ideal mother.’ She has kind, nurturing, serene, patient, and loving energy. Moderation is a key teaching in the Buddhist spiritual tradition, therefore one can evoke Buddha whenever help is needed with balance/finding the ‘middle path.’ Buddha’s energy is helpful in situations or life lessons where moderation is required. Other energies associated with Buddha include love, respect, dignity and peace. Buddha’s presence is a wise and serene energy. Jesus is unconditionally loving, forgiving, gentle, and kind. Because his energy is so unconditional and accepting, it is a very healing energy too. This is the Ascended Master with whom I am most familiar, having spent many lifetimes in the Christian faith. Quan Yin is a Buddhist Goddess. Her name means ‘she who hears prayers.’ Her energy is characterised by compassion. She represents feminine power and beauty. Quan Yin also teaches harmlessness (i.e. doing no harm) and has a fierce and protective aspect to her energy. Kali’s energy is intense, ferocious, determined, and courageous. She encourages us to live fearlessly and has a reputation for being available to help us destroy that which no longer serves us. Call on Kali when you need help dismantling something in your life which no longer benefits you. Krishna is a Hindu deity. Krishna’s energy can be defined by its joyful quality. His energy is warm, sweet and loving. Some believe that Krishna helps with romantic relationships. He is often depicted in paintings and images with his partner, Radha. Lakshmi is the goddess of abundance and good fortune in the Buddhist and Hindu traditions. Her energy is found around those who are striving for abundance, including material abundance, emotional fulfilment, and good health. A sage and psychic, Merlin is said to have helped King Arthur during fifth Century Camelot in Wales. Some believe that Merlin is just a legendary figure and others believe that he actually existed. Either way, Merlin can be called on for assistance. He represents the inner/subjective realm – internal strength and power, and all forms of intuitive development. For this reason, you may find Merlin around psychics and those who are interested in metaphysical topics. If you are on a path of psychic development, you might like to call on Merlin to help you on your path. Although Archangels & Ascended Masters are often associated with certain religions, you do not have to be religious to call in any of these beings. For example, I am not Catholic, but I enjoy working with Mother Mary and her energy shows up when I ask! 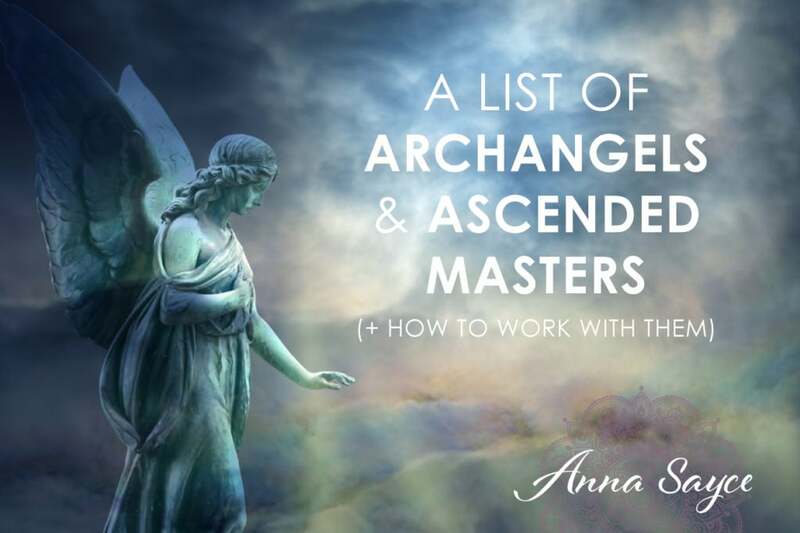 Which Archangels and Ascended Masters do you like to work with and call on? Very interesting to find the missing pieces of a puzzle on my journey of life – thank you for this. I like to call on Jesus, Mother Mary and St Micheal in the past and still now and since studing Anna’s classes I feel ascended master Merlin has helped and others too. But I am still unfamiliar with most all ascended masters but brings light to me knowing it is possible to call on them for guidance. Much appreciation. I didn’t know you could collaborate with archangels and ascended masters together. Thank you for posting this blog regarding Arch Angels and Ascended Masters. It was exactly the information I needed today! I was out earlier on errands and was thinking that it would be beneficial if I received some spiritual encouragement from Anna in my email, and Voila! Here you are! With precisely the information I wanted. …..Oh… You’re good Girl! !…You’re good! Your blog will help immensely now that I know who precisely to call upon and for the right reasons. Have an awesome day Anna! university to take an exam. I would also ask her to help me remember what I know. When I read that she was associated with parenting and fertility , I thought maybe I should have asked for help elsewhere. Then I read it again and realised that she was comforting me as a mother would. (my mother lived halfway across the country) Thank you for this. I get “aha” moments when I read many of your blogs. As an aside, I ask for my grandmother’s help when I’m looking for something I’ve lost. I think she grew tired of this – lol – and gave me the gift of being able to find things for myself and others! Hi Anna! I enjoyed your article! When times get bad I always sing “Hare Krishna”. I have no knowledge of why I do this. I even had to look up the meaning. Any thoughts? Theresa – that is funny – I wonder if it is a past life bleed through? “Hare Krishna” pronounced as ‘Hareyyy Krishna’ is used widely here in India, to greet or in times of grief. Maybe you have a past life connection to the east and Hinduism just like Anna said. As an Indian and a Hindu, I would like to share that Krishna is the symbol of love and joy, like Anna has mentioned. He his known for his teachings on Bhagwad Gita which is the Hindu holy book, just like the Bible is for Christians. Thank you for your wonderful article. You are right. Religion doesn’t matter when contacting the angels or ascended masters. I have had few experiences of Archangel Michael and felt the loving presence of Jesus once or twice. It feels great! Thank you for your comment. I agree with you and Anna, I believe it is a past life. Time for me to do much research!